Breaking news for Adeptus Mechanicus and Imperial Knight fans! Look at what I found today from Bell of Lost Souls! 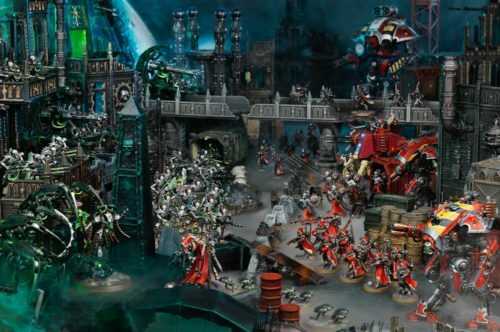 I'm not sure but apparently we'll be getting a Techpriest Dominus, 10 Skitarii and 2 Armiger Warglaives! 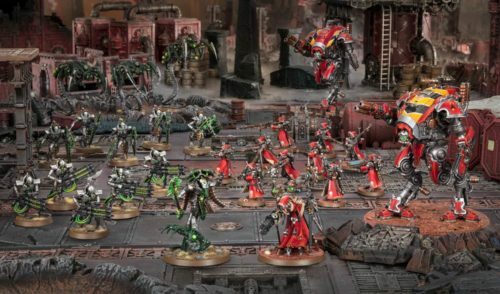 For Necrons, they would be getting a Cryptek (the new one), 5 Immortals, 5 Lychguard, and apparently 3 Canoptek Wraiths! Wow, that's a lot of rpsues. I wonder if it's a new board game or something. Across the Imperium the worlds of the Adeptus Mechanicus are under attack. An ancient xenos empire is rising from beneath their feet, forced into awakening by the anarchy of a galaxy at war. The cold and metallic Necrons, roused from their aeons-long slumber, intend to restore order and obedience to their worlds through extermination - even should it mean the slaughter of every Adeptus Mechanicus and Imperial Knight usurper to have trespassed upon their soverieng domain. Take command of a technological epire in desperate clash for the most precious resource of all. There can be no mercy - in the grim darkness of the far future, there is only war! Yeah, I wrote out the description on the back for you guys - there are some words I can't read because of the glare, but that should be the gist of it. 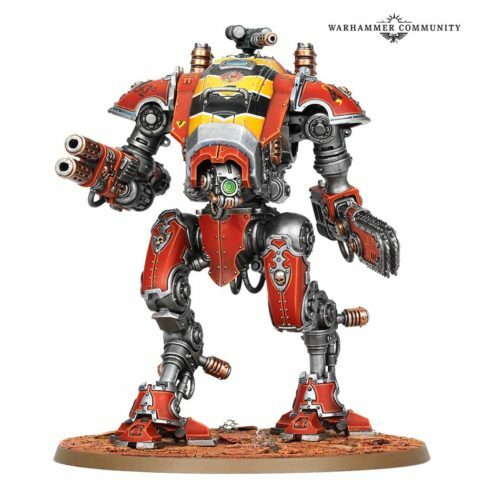 Important things to note - both Adeptus Mechanicus and Imperial Knights are in this, so Armiger Warglaives are definitely an Imperial Knight model, not Adeptus Mechanicus. I can't wait to get this! And what do you know...Warhammer Community officially posted on this just right now. Nice. And Holy Throne on Terra! 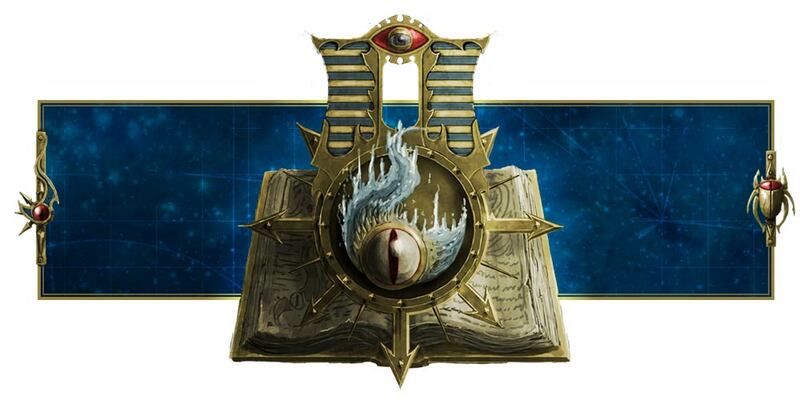 Thanks to the blessings of the Omnissiah, it seems that Forgebane will expand on the lore and talk about the discovery of the Blackstone, which has the power to both neutralize and amplify the fell powers of Chaos! 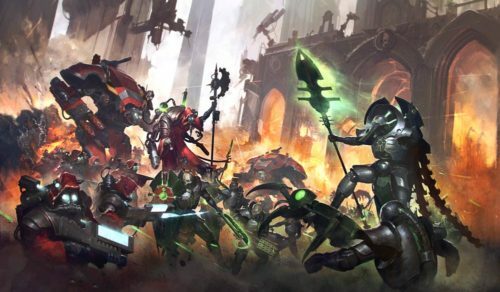 In any case, the Adeptus Mechanicus discovers that the ore-rich worlds they colonized as forge worlds happen to be tomb worlds, and now Necrons are awakening all over the galaxy in the wake of the Cicatrix Maledictum. And you know what this means. WARHAMMER 40,000 Wargaming time! 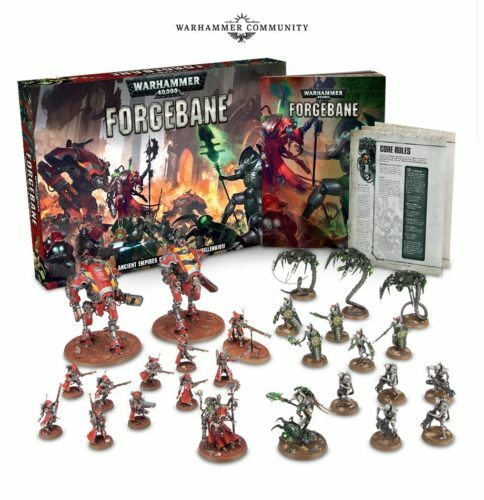 Time to pick up new units for my Imperial Knights! And this looks good value for money! Knight Armiger Warglaives! I'm getting the box for those two alone...and I look forward to reading the lore. Can't have too many Tech-priests Dominus and the Skitarii would make a nice addition, I guess? 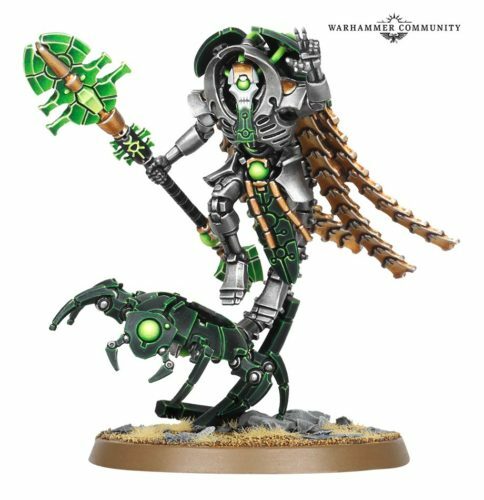 We have the Cryptek for Necrons players. They look cool. But this is the one that I want. Knight Armiger Warglaives. Lightweight class of Imperial Knights, they are piloted by lesser nobles or commoners, who scout ahead and eliminate threats ahead of time. Awesome. The Omnissiah blesses! I'll see how many points they cost, so if I can add a third one, I'll be able to build 2 Super-heavy Detachments of 6 Imperial Knights (3 Knight Armiger Warglaives to accompany my current 3 Knights) for a whooping 6 extra Command Points (9 in total)! This is going to be great value for money! I can't wait! Apparently it will be out soon. How soon, I have no idea. But I'll let you guys know when I get more news!